The EJC 2016 Almere Fight Night was the biggest combat tournament ever! 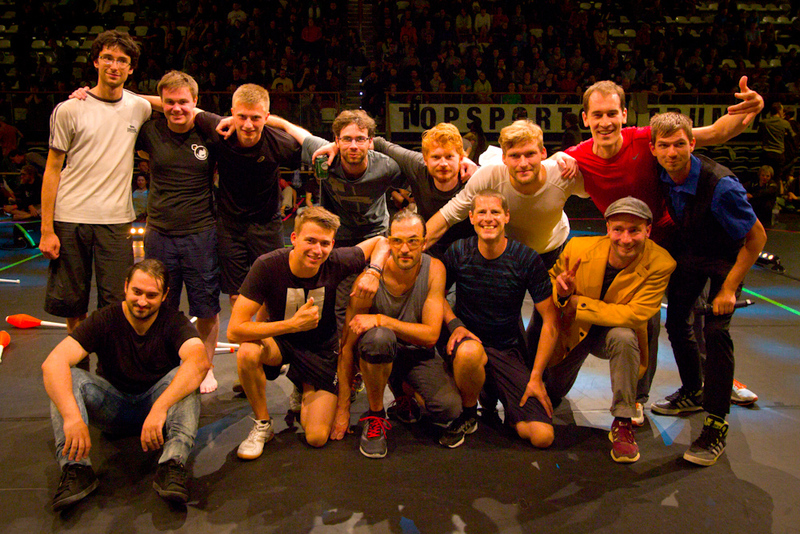 98 jugglers entered qualifications, with 32 going through to the knockout, and the top 12 battling in front of thousands in the late night finals. The tournament also featured the strongest field of participants of any tournament, including 20 top 25 ranked players. You can see how it compares to the previous biggest tournaments (like the EJC 2014 and NJF 2015) here. With 1250 ranking points available to the winner, and up to 82 points available to jugglers who did well in qualifications but didn't make the round of 32, there's been a lot of change in the FNC rankings. The biggest mover is, of course, Jochen Pfeiffer, who returns to number 2 in the 52 week rankings and climbs 35 places, again to number 2, in the 2016 race rankings. Eóin Allan, the winner in 2015 but who didn't return to defend his title, drops 15 places to 17th. Julius Preu, with his fourth place finish, climbed to 4th in the 52 week rankings. Florian Marienfeld, who came third, is now the highest ranked juggler (6th), and the only juggler inside the top 17, who hasn't won a tournament in the last 52 weeks. Strong results (round of 8) for Alexander Müller, Danny Cooper and Jakub Szwed keep them in the top 10 or close to it. Danny's win at CoastCon the week before the EJC means he's up to 8th in the 2016 Race Rankings. Thanks from the whole team! Last year 70 jugglers took part in the qualifications for the EJC Fight Night, making it the biggest tournament qualification session by far. Thankfully it was just within the limits of the software specially created to help smoothly run a fair and exciting tournament. In preparation for the EJC 2016, the software tools have been completely overhauled to be far more flexible and speedy to use, and now should work for up to 640 jugglers easily, if that many people want to take part! And you shouldn't hesitate to come along and sign up for the qualifications, even if you don't think you'll be in the top 32 (who will qualify for the knockout rounds) or the last 12 (who will make it to the on-stage finals). Why not? There should be over 100 rankings points awarded to the top non-qualifying players from each qualification group, and plenty of points for anyone who wins any matches in qualifications. And to the overall winner, 1250 rankings points, making this the most valuable tournament ever (previous EJC Fight Nights were all 1000 point events). Maybe Jochen Pfeiffer will return to his winnings ways, maybe Eóin Allan will return to defend his 2015 title, maybe Luke Burrage will go one better than his six previous runner-up finishes... or maybe we're in for a big surprise! So the EJC is the best way to rack up points for the FNC current rankings and the 2016 Race to Berlin. Due to the EJC being in a tournament category all of its own, 100% of these points will be counted, no matter your results in other tournaments. Considering just 5 points separate Brook Roberts and Rob van Heijst, the second and third placed players in the 2016 Race Rankings, every qualification match will count! To take part in the EJC Fight Night qualifications, come along and sign up no later than 2pm on Tuesday 2nd of August. The qualifications will start as soon as possible, so if you're not signed up, or in line to sign up, at 2pm, you'll be left out. The qualifications and first round matches should be finished up within an hour and a half.